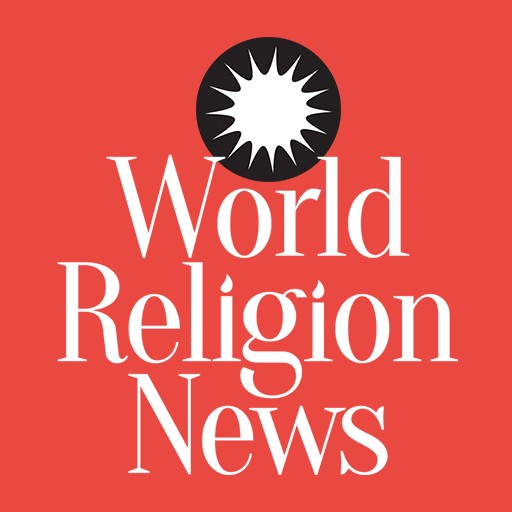 A week of mourning was capped off with two religious funeral services spanning two states on Wednesday and Thursday. Former President George H.W. 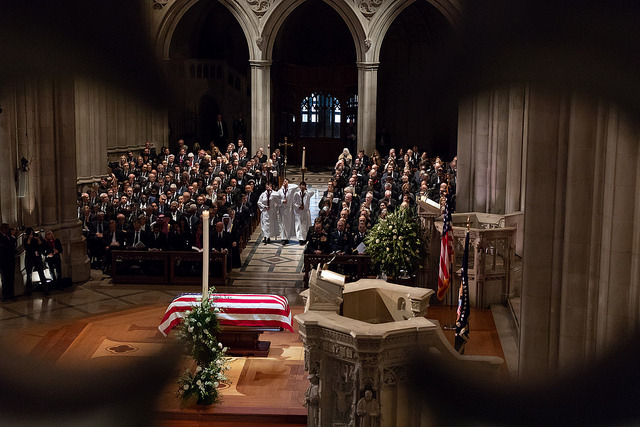 Bush, who died at age 94 on Friday, November 30, 2018, was honored in a funeral service in Washington D.C. Wednesday at Washington National Cathedral. It began around 11am EST. World leaders and current and former presidents, including Barack Obama, Bill Clinton and Jimmy Carter attended the ceremony. 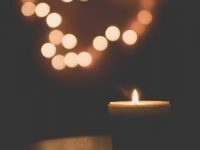 Some of the performers of the musical tributes were George Fergus, Organist, Washington National Cathedral; The Cathedral Choir, The United States Marine Orchestra, The Armed Forces Chorus, The United States Coast Guard Band, and Ronan Tynan (soloist). 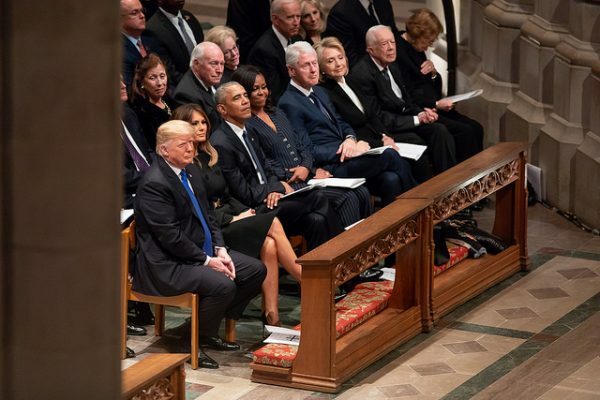 President Donald Trump and First Lady Melania Trump arrived last, taking their place at the front pew, shaking hands with the Obamas who were already seated. 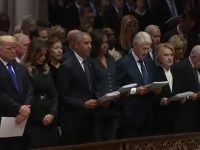 Former president Bill Clinton, former First Lady and Secretary of State Hillary Clinton, and former president Jimmy Carter were also at the front pew. When George W. Bush arrived, he shook hands with each of them, slipping what seemed to be a piece of candy to Michelle Obama. He performed the same gesture in John McCain’s memorial service. After days of heartfelt tributes and a state funeral in Washington befitting of a national hero, Bush was brought to St. Martin’s Episcopal Church in Houston, Texas where he was honored for one last time in a worship service today. Bush and his late wife, Barbara Bush, were active members of the Houston church for 50 years. The morning service was “intended as a celebration of Bush’s life,” according to the Washington Post, starting with a rendition of “America the Beautiful.” The front row was occupied with the late former president’s children, including former president George W. Bush. The church was quiet when the coffin was carried in, with some of the attendees covering their hearts as it went by. “The Star-Spangled Banner” was played when it arrived in front of the room, where about 1,000 guests came to pay their final respects to Bush. Hours before the funeral service, over 10,000 mourners were present to bid goodbye to the former president. 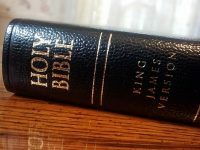 Singer Reba McEntire sang “The Lord’s Prayer” during the service. Bush’s grandchild and Texas land commissioner George P. Bush regaled the crowd with stories of “gampy,” “playing horseshoes, serving Klondike ice cream bars and challenging the grandkids to games – and sometimes offering a ‘first-to-sleep’ ” award.” Rev. Russell Levenson Jr. honored George and Barbara Bush in his homily and said they were “devoted members” of the church. He said that George would serve coffee in church and teach Sunday school. He also shared the very same prayer that Bush uttered when he was sworn into office as the 41st president in 1989. When the last word on George H.W. Bush is written, it will almost certainly be this: the fulfillment of a complete life cannot be achieved without service to others. The flag-draped casket was placed in a hearse to be transported to the Union Pacific Railroad’s Presidential Train Car. It traveled through cities in including Spring, Magnolia and Navasota, ultimately bound for College Station, Texas. The entire journey was two and a half hours long. The casket arrived at the George H. W. Bush Librarin Texas A & M University at around 5 p.m. EST. This is the first presidential funeral train car since 1969. A motorcade took Bush to the presidential library. As Bush’s casket was carried to his place of burial, the largest ever 21-aircraft ‘Missing Man’ formation flew over the funeral proceedings at the George H.W. Bush Presidential Library and Museum. The aircraft departed from the Naval Air Station Joint Reserve Base Fort Worth. Capt. Kevin Mclaughlin, commander of the Strike Fighter Wing Atlantic, and pilot of the lead plane in the formation said to NBC Wednesday, "This is an honor. He is the true definition of humble servant leader. He served in World War II as an aviator. He devoted the rest of his life to a career in service, culminating in the presidency of the United States, and even afterwards continued to serve in various roles both in and out of government. There is no individual that I would submit that naval aviation respects more than President Bush and this is really a small token of our appreciation and frankly the least we could do." George H.W. Bush is to be buried next to his wife Barbara and daughter Pauline Robinson Bush, who passed away from leukemia before she turned 4.